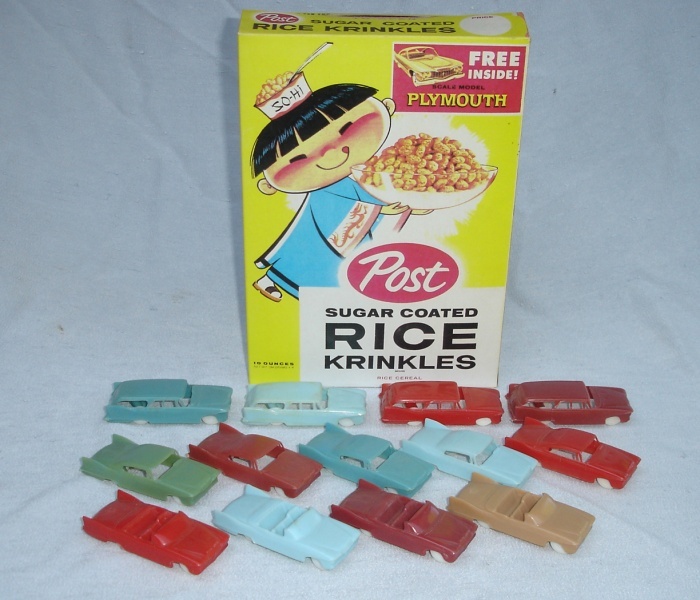 Free toy cars just for eating breakfast. Posted February 23, 2016 by HPGhotrodLogin & filed under Uncategorized. We all know that toys have been found in cereal boxes since at least 1910. Toy cars have been a part of the many different premiums that the cereal companies have baited consumers with over the years. The mid-century toys are my favorites. In about ’51 or ’52 Wheaties offered a free auto emblem in their box. Along with that was an offer to buy the set for 25 cents. There were many badges from all over the world and lots of American cars. Many of which don’t exist anymore. All four Chrysler Corp. brands were offered. Chrysler, DeSoto, Dodge, Plymouth. They were stamped steel and painted bright colors. Nicely done. Not a car but at least it’s their badge! This is a photo I found on-line. Shown are the Chrysler, DeSoto, Dodge and Plymouth. I wish I had the set! I only have the Chrysler and Dodge. Post cereals had a long running toy car giveaway program. Most of the cars were Ford products starting with the ’54 Ford and Mercury line-up. In ’55 they went to just Ford cars. In ’56 they featured Ford’s big trucks and Fruehauf trailers. ’57 was back to the Ford car line-up, and it included a station wagon based ambulance and a sedan highway patrol and fire chief car. All of which are common to find. ’58 switched to boats and the Century product line. In ’59 Post featured the Ford Thunderbird cars, both hardtop and convertible. But in 1960 a strange thing happened! They featured Plymouth cars! Granted, these were not the best Plymouths to feature. I think the ’58 would have been the best one but I’ll take what I can get. The models represented were the two-door hardtop, the convertible and the station wagon. There were 5 colors advertised on the box but I have 6 colors in my collection. Valiant red, plum red, caramel brown, chrome green, sky blue and twilight blue. I don’t know the story on the Valiant Red cars and why they weren’t mentioned. These are all photos of my collection. The box is a reproduction made from scans of a real box. The phrase, “America’s solid car for 1960” refers to the new unitized construction. The models aren’t executed very well in the front. They are the victim of mold lines and draft angles, so the brow seems a bit too heavy and the bumpers too receding. Still I’m glad to have them, even though I don’t personally remember these cars in my cereal. My earliest recollections are for the ’61 Thunderbirds. My brother and little sister and I fought over those! About 1970 I remember that four different muscle cars were offered in cereal as “model kits”. They were the Corvette coupe, Mustang convertible, the Ford GT race car and the Dodge Charger Daytona! They were smaller than HO scale and featured opening doors. Although I think they would have been better off if they hadn’t tried that. They never quite closed correctly. The cars were molded in a soft plastic like polyethylene and came on a “tree”. There was a foil sticker sheet with numbers, stripes and hubcaps that never stayed attached. A very strange thing to try back then but I enjoyed them as a 14-year-old kid. They were intended to be shot across the room with a rubber band. The long flat part holds the small rubber band. There is a peg under the cars that the band loops around then the car sets in the holes waiting to be launched. 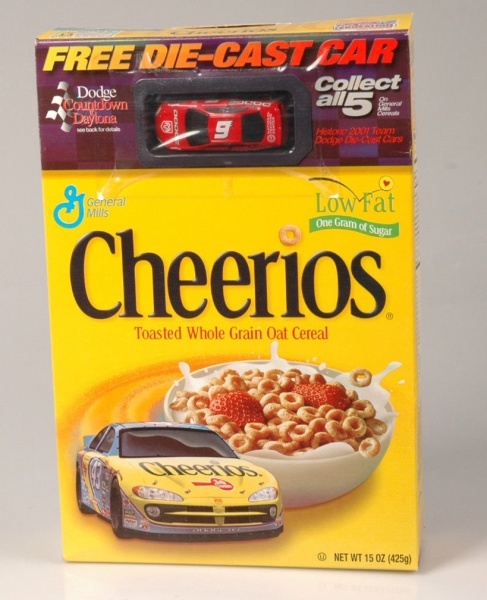 Fast forward to 2000 and an actual die-cast Dodge was available in Cheerios! It was the Intrepid NASCAR racer. It was Petty’s ’43 car along with some other team cars. There was also a ’74 Charge available but I was never lucky enough to find one. Instead of having to dig through the box and hoping to luck out and get the one you wanted; the car was placed in a window on the front of the box. You knew in advance what you were buying. That was a big help. Since I wasn’t a huge NASCAR fan I didn’t go nuts for these latest offerings but I know the rest of the car-crazies did! Unopened boxes can be found on eBay. Found this box photo on-line. The car below is from my collection. In the mid sixties small toy cars were given away in the Fritos variety packs and such. I know it’s not cereal but its still food and still MoPar! My mother used to buy those Fritos packs with a cardboard tray and about 6 or 8 lunch-size bags of chips. They gave away little plastic dinosaurs and cars in those boxes. Since the trays were open on top with a cellophane wrapper, you could shake the box back and forth to see the prize lurking at the bottom. The toys were made by Multiple Products Corporation. The cars were merely a cheap little one-piece molded representation of a real car. They were part of the “101 Cars of all Nations” series that came in a bag and a paper label stapled at the top. I remember getting the ’61 Chrysler and Studebaker Hawk in Fritos. 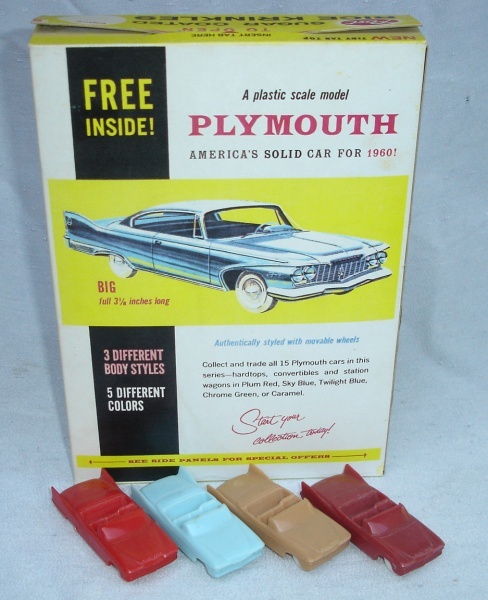 Multiple Products offered a set of 101 cars in ’54 featuring everything made around the world and an up-dated ’61 series that provided the cars for the Fritos give-away. Of course they were a few years out of date but I didn’t care. I liked the earlier cars just fine! In the ’61 series “MPC” offered the Chrysler Plymouth, Dodge, Imperial and Valiant. All were hardtops. These were the last vestiges of The Forward Look cars and the most controversial of the designs. In some cases that means homely. More from my MoPar toys collection…the Valiant, Chrysler, Dodge, Plymouth and Imperial. Most people confuse the Multiple Products Company logo found under the little cars with the MPC model kit manufacturer. MPC in their case stands for Model Products Corporation. The two are not related and Multiple Products was around long before the model kit company. Yes, I have a fixation of my childhood in the sixties. That’s one of the reasons why I wrote Hot Rod Bunny as a story that takes place in ’64. I wanted to re-live a little of that feeling and pass it on to others who didn’t experience it. Hi Brad, I had one of the 1960 Plymouths that I got from a Post cereal box. Don’t know if I still have it somewhere. It was a blue hardtop, if I remember correctly. Later on I found a few Hot Wheels in Cereal boxes over the years. I also seem to remember some these cereal promotions as being part of a contest in which the prizes ranged from 1/25 scale models, (maybe), to gas powered go carts with a car body of what ever make was being promoted. The grand prize was a full size car. I am not sure about this. However I do believe that there was some sort of contest around 1961 in which 1st prize was an Impala and the go cart was a Corvette. Smaller prizes were Corvairs or maybe the Corvair was the big prize and the impala was the toy. Anyway, thanks for sharing the pictures and memories. I remember most of those too! I was always jealous of the big battery operated T-Bird kiddie cars that were given away in the fifties and sixties. I think Nestle’s Quick had that contest going. Sorry Jerry, I don’t have any extra F&F convertibles right now. You have a really great car! Thanks for checking out my Hot Rod Bunny blog.